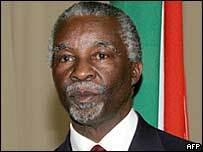 South African President Thabo Mbeki has indicated South Africa might repay some of Zimbabwe's foreign debts. Speaking in Pretoria, Mr Mbeki said his country could help pay off Zimbabwe's near $300m (£172m) loan from the International Monetary Fund (IMF). He said it was in South Africa's own economic interests to assist. South Africa is Zimbabwe's closest ally and has resisted international calls to pressure Harare to end many of its controversial policies. Earlier this month, the IMF gave Zimbabwe six months to meet its obligations or face expulsion. The country is on the brink of economic ruin, widely blamed on President Robert Mugabe's autocratic rule. President Mugabe is currently in the Chinese capital, Beijing, where he is reported to be trying to obtain a new loan from the Chinese authorities to help Zimbabwe tackle its economic crisis. Mr Mbeki said it would be "incorrect and counter-productive" for Zimbabwe to be expelled from the IMF. "It may very well be that South Africa may take whatever portion of Zimbabwe's debt. "We don't want Zimbabwe collapsing here next door because South Africa would inherit all the consequences, and we don't want that," he said. But he stressed nothing had been decided and talks with Harare were continuing. Mr Mbeki avoided criticising Zimbabwe's controversial slum clearance programme, which has left some 300,000 people homeless. Rather, the president welcomed calls by UN envoy Anna Tibaijuka for greater outside help for Zimbabweans affected by the crackdown to recover. "It would be very, very good indeed if the United Nations engages in this process to help Zimbabwe solve the problems it faces," he said. His comments came two days after the UN published a damning report on Zimbabwe's Operation Murambatsvina [Drive Out Rubbish], calling it a violation of international law.